Launceston coach Mike Lewis says fly-half Kieron Lewitt is key to his side in National Two South. 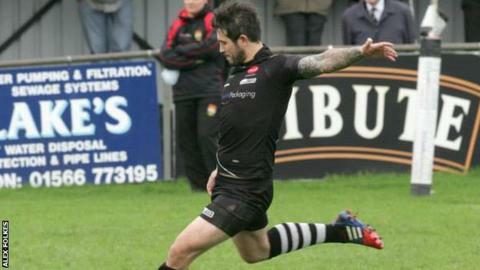 The Cornish All Blacks captain is the league's leading scorer so far this season with 181 points, including all 15 in the draw with Redruth last month. "When his kicking percentage is high, it doesn't matter if he's kicked two in a game or 20 in a game, we tend to get a victory out," said Lewis. "But it's not just his kicking we rely on, he's a fantastic individual." Launceston, 10th in the table, will hope to build on their draw with Cornish rivals Redruth when they travel to struggling Shelford. "They are second-from-bottom, but they are a strong side and they're pushing teams you don't expect them to push, so they're not a bad side," Lewis told BBC Radio Cornwall. "If we don't go up there with our heads screwed on we'll probably shoot ourselves in the foot because it's a game we really should be winning, it's game we need to win and one our players are capable of really winning well."